Conveyed to the Friends in 1999, this church is remotely situated, deep in the Black Mountains (Brecon Beacons National Park) in a large and ancient churchyard. Of thirteenth century origin it is renowned for its huge fourteenth century screen with loft painted blood red. The panels above have small quatrefoil openings to allow a view from the loft to the high altar to the east. The altar rails are of seventeenth century date and the church possesses a fine run of simple evocative monuments, and some wall paintings. As at so many of our churches the local people here regularly use the church for meetings and concerts – in particular Llanelieu features in the Talgarth Festival. Llanelieu features in Andy McNab! 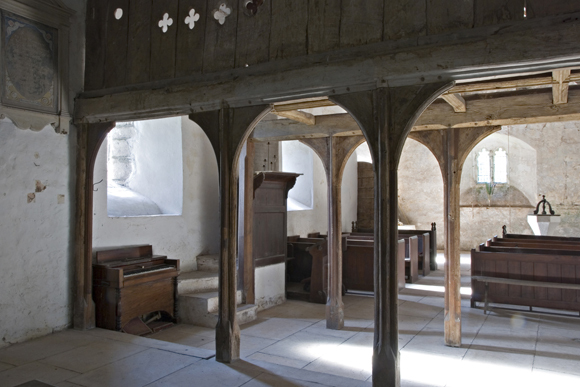 The rare medieval rood screen at Llanelieu, on which you can still see the ghostly outline of the cross removed at the Reformation, is much admired by visitors and architectural historians alike. But we were delighted to discover it also features in popular modern fiction. In ‘Fervala’ (2015) by Andy McNab, his hero Nick Stone writes: “I parked not far from the church at Llanelieu. I first spotted it when Trev and I had found our way out (of our hideaway on the western edge of the Black Mountains) and gone back later when I started getting excited by medieval history. God no longer pays St Ellyw’s formal visits, even on Sundays…and I wanted to see if the loft was still painted blood red.” It is! Thanks to our Trustee John Morgan Guy who spotted this! Remotely situated in the hills of the Brecon Beacons. Nearby is Llanelieu Court, an enigmatic medieval house which the church originally served.